It’s been a long time since I had the opportunity to write, and I find myself making excuses when I do get the time. Most of my sharing now is on Instagram, and unfortunately I can’t get an automatic process to share the blog on IG to work. In fact, this post has taken me over a week to write. I’ve been busy working on set design and building. We’ve had three performances thus far, although the materials for the first were borrowed from the second one. From Screen to Stage has more details on those two plays with the front door set. The third one just wrapped up, and was a fairly simple build, at least from a hard product standpoint. I reused the blocks I made in All the Workshop&#8217;s a Stage for a base for a few sheets of plywood. The goal was to make an elevated stage on the stage for a panel to sit on with chairs and a desk. I painted the plywood and pinned them to the blocks. I made a simple desk frame out of 2x4s and loose tenons. I also made frames out of MDF molding for a cityscape that was mounted on rigid foam. I also made two short steps to get up onto the elevated stage, plus another full set of steps for the actual stage. I also worked a bit more on the Hanging Tool Cabinet, and some systainer storage solutions, which I will post about at another time. It’s hard enough to finish this post without adding more. There were a few things that I got accomplished towards the end of the year that I either didn’t have time to write about, or they weren’t worth dedicating a post to. Here we go. 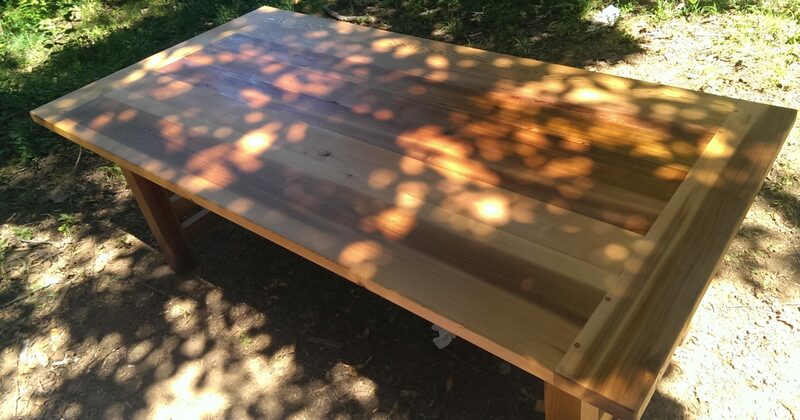 I built an outdoor table to help with breaking down sheet goods and large assemblies. It is just a skeleton at the moment while I decide how best to do a top for it. I also may add other features, like a shelf at the bottom, a hook for the cord reel, etc. I built it out of pressure treated lumber, did pocket hole screws throughout, and it should hold up much better than the previous one. I also built it so that it is level on the uneven terrain. Instead of building a mirror cabinet for the master bath, I went with an Ikea unit. Made much more sense based on cost and time. The old mirror will be reused in the other bath, and I will be making a frame for it. I’m just procrastinating or it would already be done by now. Perhaps that can be the first project of the new year. I did some general cleaning up of the shop the other day, and it finally feels like an actual shop again, one where I can come in and do work. I moved a couple of things around to help better organize, but it’s something that will continue to be addressed in the new year. I used thread locker on the MFT’s hose arm, as to stop it from flopping over at just about every opportunity. I think I may drill into the arm and put in something that I can wrap the end of the hose back to to keep it out of the way. I tried making wooden rings. It didn’t go half bad, but I don’t know if it is something I will try to keep doing. I bought some new tools, sold or gave away some old ones. I went on some adventures, and resolve to go on bigger ones next year. Thanks for reading. I am attempting to document projects on YouTube, and this is the first spoken video on the channel. I am currently filming progress on my next project, so feel free to subscribe for any videos I might finish. Sooner than this project will be finished will be a shop tour. I’ve been dealing with an issue where pictures would not load to WordPress from Lightroom, and just now have resolved the problem. I also have been struggling with time and incentive to post, whereas I have been making much more use of Instagram. I am phasing out Twitter, as I don’t like the platform. Hoping to get some new content up on the site soon, however just writing this has taken entirely too much time as it is. I am also considering video work to compliment the Instagram channel. Stay tuned. I will now figure out where I left off and get some new content up shortly. There’s some prominent members of the woodworking community like Marc Spagnuolo and Eric (The Poplar Shop) that have started subbing out their Festool products with other brands. With some good reasons I actually agree with. However, I’m actually going in the opposite direction, and I’ll explain why. The beginning is a good place to start, and in this case the only place to start. As a hobbyist woodworker, I have no endorsements. I am not popular enough on Instagram, I do not like appearing on camera so YouTube isn’t really an option. So, I either buy all my tools, equipment, and supplies myself or they are gifted to me by family. So, in short, Festool does not sponsor me. Even though I’d love for someone to sponsor me. Message me. I bought the TS 55 back in early 2014, and it has been a fantastic addition to the shop ever since. I wasn’t getting the results I wanted with my circular saw and a gripping clamp system (which I actually still have). Buying the TS 55 and 1900 rail was no small deal at the time, with it being my first foray into the world of premium-priced tools. What I got out of it though was worth the cost. It worked well, was a delight to use, and I got much better results from it. In truth, it was one of the defining moments of my hobby, understanding that there is a lot of truth in getting what you pay for. That really set me on my way, and sold me on the concept of a system. It helped that names in the industry were also using and championing them. The Domino continues to be one of the best home-use tools ever invented in my opinion. I bought an MFT, even though I really didn’t have the room, because I wanted a good place to use both the Domino and track saw. Then an auto-start vac. A sander, then another one. A jigsaw. I paid money, took up valuable shop real estate, and replaced other options because I believed in the system, believed that these tools would help me down my path to be a better woodworker. That’s not to say the company hasn’t made mistakes. In truth, it seems a lot of poor decisions have come about after the USA rep left, but I don’t know if that’s a chicken or egg scenario. Perhaps he was frustrated and left too. I think the yearly price increases are stupid, and have thought so even before I started buying. I do think they are overpriced by 10-20% in some cases, or closer to 50% in terms of their drills. I will likely never own one of their drills. Their decisions on what to bring and what not to bring to the US market are indefensible. I don’t think they listen at all to user feedback. They don’t make minor revisions to the tools that need them. All of that said, I do enjoy using them. If I can afford them, and make me happy, there’s no reason for me to stop using them. If they give me good, worry-free results, I should look to add more of them where needed. With that in mind is why I just added the cordless TS 55. I don’t have a truck, but hope to have the funds for one in about a year. Even with one, with the set building responsibilities that I will have for the next few years, I need a way that I can build on-site (or anywhere). With the last generation batteries on clearance, I thought it might be a good time to jump. I had considered going with Ryobi’s 18v brushless saw, and adapting it to the Festool track, but remembered my poor results with the Pro Grip system. I didn’t want to go to that trouble, even though I am already invested in that 18v battery system, but trying to bodge something together poorly. So, I decided to buy the cordless TS 55 and sell my corded one for about a similar total cost. It’s a similar story with my regular circular saw. I don’t enjoy using it to cut dimensional lumber, so I’m looking at the cordless HK model with the attached track. It will help on my deck build plus set building. In fact, I have envisioned use for all the Festool I plan to buy in the future, and will be adding them slowly as needs dictate. After the HKC, I don’t know what will be next. It will depend on if I need to strip paint (Rotex), build the bed frame (Domino XL), or what. And by no means is it Festool or bust for my future plans. I’m very happy with my 12v Bosch drills/drivers, and will be looking into their Flexiclick system with changeable heads. I need a good bandsaw, which Festool obviously doesn’t make. The miter saw upgrade may or may not be Festool, depending on my needs for usage outside of the shop. I buy what I like, and sell what I don’t. I may sell the Pro 5 sander because I otherwise don’t have a use for the 5″ orbital. Can use that money toward a Rotex (6″) or something else. Currently working on what could be considered a to-do list, a to-buy list, and a general summary of what has gone right and what I need to improve upon after a year in the new shop. I’ve done to-do lists, I’ve done potential purchases, but I kinda feel like getting into the weeds of really explaining things if possible. I haven’t quite nailed down how it will be broken out, but it’s going to be in depth and long. I haven’t had much time to write lately, but I’m going to try and make the time and it be more of a long-form blog entry. Today, by complete coincidence, is one calendar month past Christmas. (Well, yesterday; it takes me awhile to write these days) It’s also basically one calendar month since I’ve been in the shop for more than two minutes. It’s been less on purpose than just a matter of circumstance. Very cold weather, weekend activities, and other things have pretty much kept me indoors since I finished up my Christmas gifts. One of which is a flag case I made for my in-laws after my FIL passed in December. It didn’t turn out 100% great, but such is my skill set at this point. I did make a couple of jigs to get me through the project, and they helped out so much that I will make new ones and pay a bit more attention to detail this time. I also made a very simple necklace holder for my wife. Since then, it’s been all quiet. I didn’t even get a roof installed, for some reason. The roofing company took too long on the house, and flaked out. Guess I’ll need to start shopping around to get it done. I haven’t even cleaned up from the flag and jewelry projects. There are things on the horizon, though. I have yet another stage build to do, which I will be starting on probably late February or early March. This time, it should be fairly simple and rudimentary. I still have my son’s side table build, which I will have to sort out if I can do with a warped jointer fence. I am also finally seriously going to do an entertainment center, but in a different plan than before. The reason being is that we want to move, and this needs to fit into the new home when we find the one we want. I also need to sort out a couple things in the shop, primary of which is a MFT sysport so I can easily get into the attic. If after that we haven’t made plans to move, I’ll work on redesigning the miter station wall to better fit the space and be more portable to whatever new shop awaits. It’s really hard to concentrate lately to make a coherent post. I’m wondering if I have ADD, because I’m noticing a lack of concentration in other aspects of my life as well. Some of it may also be I’m trying to write this on my desktop and not my usual laptop. I hope to have a couple more detailed posts soon, and hopefully with more content and more cohesion. Not much happened this year. So, that’s a lie. This was the most transformative year my workshop and woodworking has ever had. I started the year talking about a new shop, like I’ve done for so many other years. The difference is this year in July I actually started on one, and it’s nearly complete as it stands today. I made a spice rack for our kitchen and I started looking at new layouts in January. I made an MFT clamp rack (then replaced it with a new one later, then made a third one). I made parallel guides for my Festool tracks. I made a bunch of stage blocks with those guides and it turned out very well. I had to buy a new TV. I made guitar hangers. I unfortunately had to make a flag case. I didn’t make a ton of purchases, but I did pick up an air cleaner, a dust extractor, and a new trim router set. Plus all the things necessary to get a new shop up and running. But the second half of the year was all about building the shop and not other projects. I’m hoping that 2018 will see a return to getting some projects for the house taken care of.